My husband and I are working hard to renovate this house. The newest finish is a big scratching post tree for our cats. It’s made out of pantry shelves covered in leftover carpet with 24’s, rope, and staples. Sweet, huh?! I love it when projects reuse things that were headed to the trash. Our kitties seem to like it even though most of them won’t cooperate for photographs. Here’s the kitchen those pantry shelves came from. Some of the top cabinets we removed will be mounted in the garage for storage. The refrigerator’s been moved to the other side of the room and we’re leaving the stove, sink, and dishwasher hooked up as long as we can. New cabinets arrive on Tuesday! We’ll install the top ones, demo the rest of the kitchen, put flooring tiles in, install the bottom cabinets, then start tiling the countertop. We might be washing dishes in the bathtub for a while. Throw back to our motel-living days! So grateful to be here. When I’m not in DIY home renovations mode I’m working on this sweet baby quilt. The done so I’m quilting it all together from the back. This is an eye-spy quilt where each novelty print fabric (ladders, owls, pumpkins, etc) is used in two different blocks. So it’s great for a baby quilt and as the child grows becomes a look-and-find game to match the fabrics up. This one is big enough to snuggle under on the couch too. With my new computer I’m now on Instagram. Are you? Let’s follow each other! I’m quiltartbymegan on there. 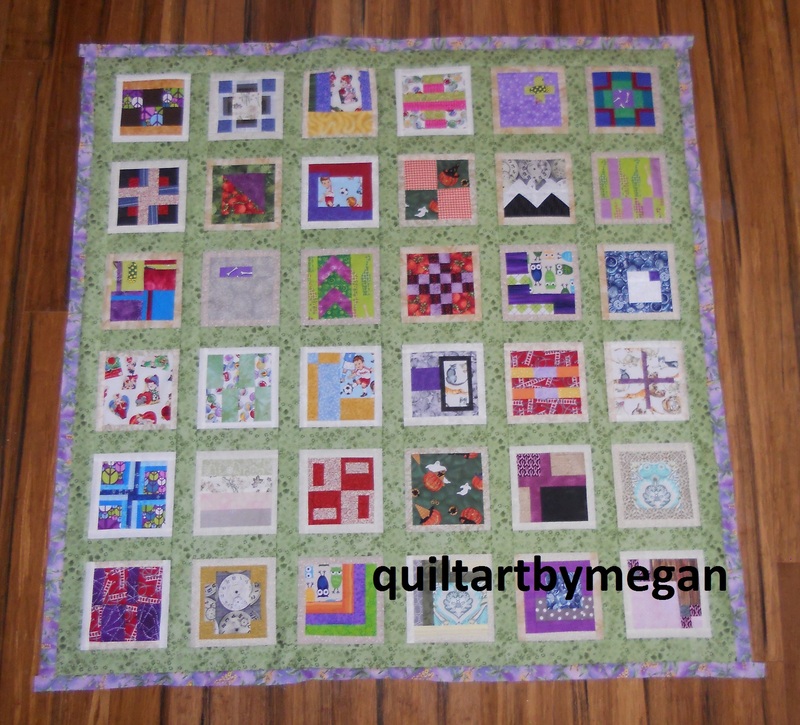 This entry was posted in Collaborations, Our House, Quilting the Quilt and tagged artist, baby girl quilt, baby quilts, cat tree, city blocks quilt, demo, DIY, eye-spy, house, house projects, I-Spy Quilt, kitchen renovations, kitties, leftovers, pantry shelves, reuse, scratching post on July 16, 2015 by quiltartbymegan.